Zoologist Salary according to the US Bureau of Labor Statistics (BLS) is between $39,180 – $97,390, an average mean of $64,230 annually. While the national hourly wage is $18.84 – $46.82, this applies to Zoologist and wildlife biologist. 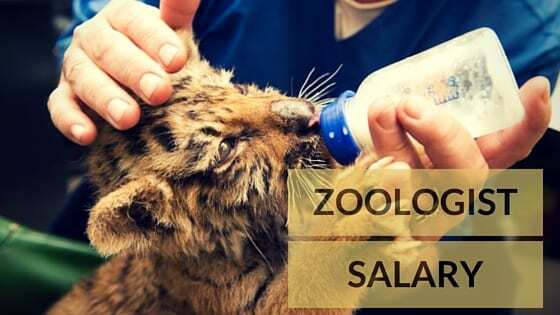 The Zoologist job requires a high level of care, observation, research and data collection. This may require working odd hours, 24 hours surveillance, travel and living in the wild. A fresh Zoologist graduate may start at the lower range and gradually rise with experience, skills and promotion to earn more income. A Zoologist may get more pay as they gain experience, starting from starter to a top professional in the field. Factors that affect the zoologist salary include geographical location, type of employer, inclusive benefits and packages, skills, reputation and education. Zoologists and Wildlife Biologists. Among the animal care scientist and doctors, the Zoologist is among the top 5 best salary earner. Zoologists are scientists who study living organisms, specifically animals (some specialize in particular types of animals), and they are employed primarily by universities, wildlife agencies, zoos, and other special attractions. The job of the Zoologist is a one of passion, however the income from it is enough to sustain a home. With more education and research the salary of the Zoologist. The average zoologist salary range in the initial stages of his or her career is $39,180 – $47,950 per year. After five years of work experience, the range is $40,000 to $59,680 per year. After 10 years of work experience, the range is $45,000 to $75,040 per year. For senior zoologists (20 or more years of work experience), salary range is $55,450 to $97,390 per year. The work of a Zoologist is somewhat specialized or concentrated. They develop skills that help them understand a type or species of animals. They learn about their life, survival skills, habitation, reproduction, feeding habits, and unique traits. Zoologists and Wildlife Biologists Study the origins, behavior, diseases, genetics, and life processes of animals and wildlife. May specialize in wildlife research and management, including the collection and analysis of biological data to determine the environmental effects of present and potential use of land and water areas. Zoologist is a science based subject and also animal science, to practice as a Zoologist one must have a bachelor’s degree in Zoology in an accredited college or university. For post-graduate studies a Master’s degree of 18 months to 2 years either in research or taught form. Most Zoologist proceed to have a doctorate, and they often conduct and write many research papers and thesis. Mostly the work in the field, remote areas; conducting lab research; knowledge of animal behavior, classification, development. Another area is conservation, while courses taken include the following: botany, vertebrae morphology, biology, zoology, mammalogy, parasitology and ecology. The zoologist salary varies with the experience and geographical location.